The goal of the Blue-Eyes deck is to turbo out a high attack monster onto the board, then protecting it with traps such as Champion’s Vigilance. Most decks in the metagame will struggle to out it, as you keep beating over tribute fodder and use Vigilance to negate any threats. 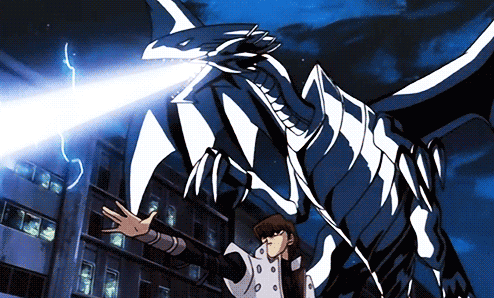 As such, gameplay for the deck is fairly linear – Use Dragon Caller to ensure you have both Lord of D. and Flute of Summoning Dragon in hand so that Flute can summon out dragons from your hand, including the classic Blue-Eyes White Dragon. Blue-Eyes will impose a lot of threat just by being on board, as it has the ability to shave away the majority of your opponent’s LP in one attack as well as beat over basically every other monster. Just because it’s big however, doesn’t make it unbreakable – Other popular cards like Gravekeepers’ Oracle and Riryoku can easily strip it’s attack, while Amazoness Swordswoman can just keep crashing into it in a seemingly unending game of “Stop hitting yourself”. As Vigilance helps us protect our dragon, ways to dig into the deck for multiple copies are extremely useful. Wonder Wand is a spell from the Yugi deck which can help faciliate this, as it can sack the Lord after you play Flute to draw an additional 2 cards. Also from the Yugi deck is Blue Dragon Summoner, a monster who can tutor your Blue-Eyes upon being sent to GY as well as also being another Spellcaster for Wand. It’s not an ideal card to summon going first, but it can help you prepare for a Flute play the next. Tyrant Dragon seems an obvious pick; It’s close to Blue-Eyes in ATK, can attack 2 monsters every turn and even has it’s own form of self-protection. However, as it’s not a Normal Monster, you need a Blue-Eyes to keep your Vigilance live. Red-Eyes Black Dragon is a serious downgrade from Blue-Eyes in it’s stats, but makes up for it by being a normal monster so you can protect it with your Vigilance. I personally prefer this option, just for the increase in consistency it offers. So that’s the majority of the deck solved already – It has a gameplan, and it’s built to try to enact it as soon as possible. However, the trade-off for this speed is the crux point it develops in it’s over-reliance on the Dragon Caller combo. If they negate the Flute? You’re in for a bad time. Windstorm of Etaqua, which has already proven to be a staple this format, and helps protect your tribute fodder for a turn as well as preventing Riryoku from outing one of your dragons. It’s main issue comes from the fact that you need to survive 2 turns of attacks to tribute summon, so Etaqua will only do half a a job it needs to. Dicephoon is a card which will leave an initial bad impression from relying on dice to even work. Admittedly, I even threw it in my bulk when I first read it, until I had to sheepishly dig it out when I took the time to consider it more. It’s the only generic backrow pop which can work straight away, offering a 2/3 chance of outing a set Vigilance or Magic Jammer. Finally, Seven Tools of the Bandit and Wild Tornado are both traps which can also prevent backrow from interrupting your gameplan. Seven Tools is better at helping your strategy go through, while Tornado is basically just a slower but more consistent Dicephoon. In conclusion, the Blue-Eyes deck is essentially solved by now, with only 3 cards which can really change as the meta evolves and starts to settle. I predict Blue-Eyes to be the dominant strategy for now as it’s peak power has already been discovered, but Gravekeeper and Amazoness do look to be very viable contenders which should rise in popularity with more experimentation.